Entries are being accepted for the fourth annual Society of American Business Editors and Writers award honoring a top young business journalist. The winner will receive $1,500 plus an expense paid trip to New York where the award will be presented during SABEW’s annual fall conference, Oct. 12-13, 2017. Journalists 29 years old and younger during 2016 are eligible. (A journalist who turned 30 during 2016 is eligible). The entry deadline is 5 p.m., Monday, July 31. See complete rules and instructions. 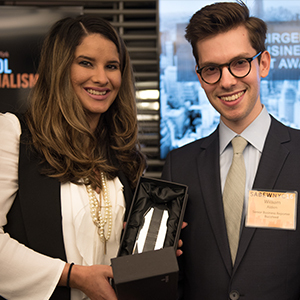 The Larry Birger Young Business Journalist Award is named after Birger, the former Miami Herald business editor who served as SABEW president in 1977. Birger was later a partner in rbb Communications of Miami until his death in 1998. The award is made possible by a gift from rbb Communications. William Alden, 27, a San Francisco-based business reporter for BuzzFeed News covering the technology industry, was the 2016 winner.